1 Preheat oven to 450°F Line a baking dish or cookie sheet with aluminum foil and lightly coat with cooking spray or lightly brush with oil. 2 In small sauté pan, sauté garlic with the oil until tender. 3 Remove from heat and stir in brown sugar. Add additional herbs and spices as desired. 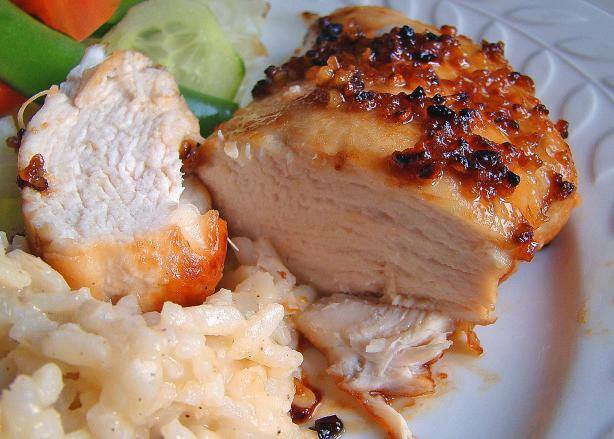 4 Place chicken breasts in a prepared baking dish and cover with the garlic and brown sugar mixture. 5 Add salt and pepper to taste. 6 Bake uncovered for 15-30 minutes, or until juices run clear. Cooking time will depend on the size and thickness of your chicken.